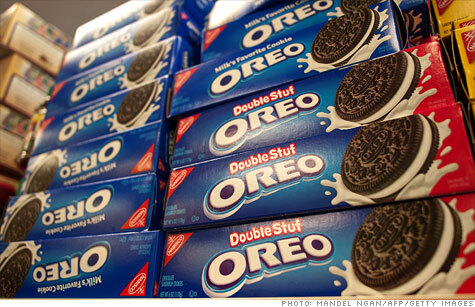 Oreo will be one of the brands in the Mondelez stable. NEW YORK (CNNMoney) -- Monde-what? Kraft Foods (KFT, Fortune 500) announced Wednesday that it plans to change the name of its snacks division to "Mondelez International" when it splits into two companies later this year. The second company, comprising Kraft's North American grocery division, will become Kraft Foods Group. The move marks the latest entry into the catalog of corporate rebranding efforts, ranging from the successful -- think Verizon (VZ, Fortune 500), formed when Bell Atlantic and GTE came together in 2000 -- to the flops (in a word, Qwikster). Kraft said in a statement that the new name -- pronounced "mohn-dah-LEEZ" -- comes from a combination of the words "monde," derived from the Latin for "world," and "deliz," short for "delicious." "For the new global snacks company, we wanted to find a new name that could serve as an umbrella for our iconic brands, reinforce the truly global nature of this business and build on our higher purpose -- to 'make today delicious,'" Kraft CEO Irene Rosenfeld said. There won't be any Mondelez-branded products; rather, Mondelez International will be the corporate home for existing brands like Oreo, Cadbury, Nabisco and Trident. The name change still has to be approved by shareholders. Assuming it goes through, the company will trade under the symbol "MDLZ" once the split becomes effective. The new Kraft grocery company will retain the Kraft cheese and salad dressing brands, as well as others like Maxwell House Coffee, Philadelphia Cream Cheese and Miracle Whip. Its ticker symbol will be revealed at a later date. Kraft spokesman Mike Mitchell said executives wanted the new grocery company to hold onto the "tremendous brand equity" associated with the Kraft name. The snack company's "Mondelez" moniker came via a combination of two separate names suggested by employees, he added, with an outside design firm also involved in the branding effort. Rebrandings have popped up in the corporate world for a variety of reasons, from mergers and acquisitions to the development of new revenue streams to negative associations with existing names. Following the merger of British Petroleum and Amoco a few years prior, the combined company announced in 2000 that it was rebranding itself simply as BP (BP), attempting to shake a reputation for polluting with a pledge to go "beyond petroleum." The company has since had to manage a PR nightmare in the aftermath of the Gulf oil spill disaster. In a more recent move, the infamous private security firm Blackwater, tied to the killing of 17 Iraqi civilians at a busy Baghdad intersection in 2007, was met with skepticism when it attempted to make itself over in 2009 as Xe Services. The company has since changed names again, this time to Academi. "The disasters are easier to pick because they stand out," said Rob Frankel, a branding expert and consultant who has worked with companies like Disney (DIS, Fortune 500) and Burger King. The successes, he said, "blend in easier." Tim Calkins, a professor at Northwestern's Kellogg School of Management who formerly worked in marketing for Kraft, cited Ally Financial as an example of a successful recent rebranding effort. The company changed its name from GMAC Financial Services in 2010, distancing itself from its former association with General Motors (GM, Fortune 500) and signaling its expanding focus beyond auto loans. Kraft's former parent Philip Morris had its own makeover in 2003, trying to escape the public ire that had built against Big Tobacco by changing its name to Altria Group (MO, Fortune 500). At first blush, a made-up name like Mondelez is likely to raise a few eyebrows. "The only people that push these faux-Greco names are brand consulting firms, because they get paid loads of money to design them and trademark them," said Mark Ritson, an associate professor of marketing at Melbourne Business School who has consulted for companies like PepsiCo (PEP, Fortune 500) and Johnson & Johnson (JNJ, Fortune 500). But in this case, he added, an empty-sounding name may actually be a good thing, since Mondelez will already have a stable of well-known brands when it begins operating independently. Similar to Procter & Gamble (PNG), which produces brands like Tide, Crest and Charmin, Mondelez will function as a "house of brands" that is not itself visible to consumers. "In a house-of-brands architecture, you have the freedom for the different brands to play different roles," Ritson said. "Mondelez should not exist in the consumer's mind -- that's the point." Even if it's invisible to shoppers, though, Mondelez will still need to ensure that its name conjures positive associations, Calkins said. "Corporate brands are very much brands," he said. "It's incredibly important for an organization, because customers don't see it, but investors, employees, and potential partners all do, and it really does shape how they view the organization."